The Bank of Montserrat Ltd. (BOM) had heavily publicised its Annual General Meeting that was held this past Wednesday, May 30, 2018. 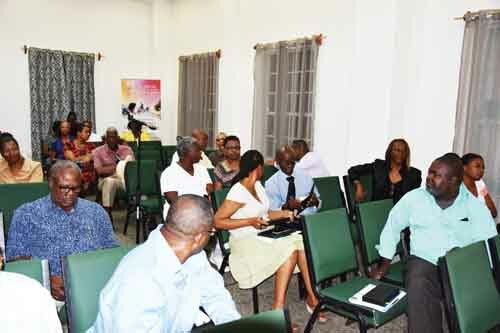 As described by several regular participants at the AGMs it was the first time that the turn out left some attendees standing as all seats were taken at the Cultural Centre’s upper meeting room. But, something happened following what some described as a productive meeting, that left some persons on their departure commenting, “this was not the best meeting, I’ve attended…” and other non-complimentary remarks. The Annual General Meeting got under way almost on time with Bishop Melroy Meade leading off with a very fitting prayer where he called upon the Lord “…bless our undertakings…and may we respond according to our consciences…”, and ‘all’ said “Amen”. The chairman Miss Venita Cabey proceeded to read the ‘Chairman’s report’ which for the most part had some good things to report, regarding especially, the Operating Environment, the Achievements, the bank’s investments in technology. It was revealed later during question time following the Financial Statement report by the auditors, PKF Accountants, who were retained for another year, that BOM does not pay taxes to the Government of Montserrat. That matter it was raised with a reference to the Government Levy tax which has created some controversy but was not entertained at the AGM. There was a familiar passionate plea on a submission regarding the devolution of the Government’s shares in the Bank. But that situation exposes the decisions taken by the bank as it does give the government, which by the way is supposed to be the interest of ‘the people’, power to change or retain and retard. The dividend was duly sanctioned; and following was the election of three directors with Directors Cabey, (chairman), Bruce Farara and John E. Ryan, all of whom as stated, “are eligible for re-election.” There were two other persons nominated and duly seconded for election, but it was probably here that a somewhat questioning shareholders lost favour with how things were progressing. Bennette Roach demanded to be heard on the secondment of the nomination but there was far more interest in the poll which in the 30-year of the bank was invoked for the first time. There was some confusion as the process began which suggested that the management seemed to have been prepared for the poll, as they ought to have been, but not as far as to how the process should be. It required according to the byelaws of the bank that ten shareholders at the meeting must say yes to the request for the poll to be taken. The majority of persons showed their confusion as no one sought to explain the process, but as ballot papers were distributed, some having received theirs upon entering the meeting. It took several minutes for the computation of the ballots, but as one photo here shows an appreciative number of persons stayed back for the result of the poll which showed that with Cabey, Farara and Ryan no doubt benefiting from the Government votes of 3,085,075, (one vote per share) and other major shareholdings, they received respectively: Cabey – 3,655,319: Ryan – 3,582,470; Farara -3,634,107; Joel – 20,835; Warren jr – 101,172. There were several persons who perhaps correctly in the circumstances stated at the end, no intervention would have changed the outcome of those re-elected. That however I contend should not prevent the proper course to be side-lined. Submission in support of the nomination of Warren Cassell Jr. for election to the Bank of Montserrat Ltd Board of Directors. 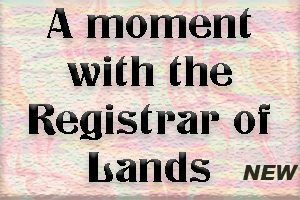 This is a plea to this nation and to this indigenous Bank of Montserrat which has withstood the times because a young Montserratian in 1988 – one of my class mate and who few years later recognizing his own shortcomings (as a banker) cried out to me because he could not get the help he needed from his current board members – that lack of help created a problem that the bank ran into difficulties. I didn’t believe at the time I should serve as a director on BOM as much as I helped in other ways because I felt there could be a conflict as president of SPCCU and chairman of NDF. SPCCU has since worked very closely with BOM especially at the start of the volcanic crisis. And it was another youth at the time of crisis for the bank who nurtured the way forward in former premier Meade. Govt has been promoting and encouraging youths to become entrepreneurs but no where is them being positioned for their voices to be heard – and for years now the only opportunity our youths have is to sail away. I am therefore reaching out to the senses of those who believe and to those who might now think of the dictum that says, just as I began “the future of a country is in its youth.” Not to be taken lightly or callously. From Just over 10 years ago has always been captivated by the world of business he started his first venture at the age of eight: a greeting card business with a small capital investment from his parents, He later started a web design business which allowed him the privilege of working with a wide range of clients from around the world. In 2013, Mr. Cassell was named Caribbean Journal’s Entrepreneur of the Year, and has been asked to deliver presentations on topics relating to entrepreneurship and finance for organizations such as the Caribbean Telecommunications Union, the Eastern Caribbean Central Bank, the University of the West Indies’ Arthur Lok Jack Graduate School of Business, and CARICOM. Warren Cassell Jr. is a third-year undergraduate accounting student at The George Washington University. Prior to pursuing tertiary education, Mr. Cassell attended the Montserrat Secondary School where he graduated joint valedictorian in 2015. He worked as a financial writer for Investopedia.com from June 2015 to March 2017 and has had his work published in a number of globally recognized publications including Yahoo Finance, Entrepreneur Magazine and The Huffington Post. Delivered a range of business and finance related speaking engagements throughout the Caribbean region for organizations such as the Eastern Caribbean Central Bank, the Arthur Lok Jack Graduate School of Business and the Caribbean Telecommunications Union. Produced exclusive one-on-one interviews with highly successful public figures including Charles Koch, who was at the time the world’s 6th richest man, Grammy Award winning artist Natalia Jiménez, and Sebastián Marroquín, the only son of the infamous Colombian drug lord Pablo Escobar. Sourced and distilled accurate financial data, whether from research reports, earnings calls or economic news aggregators in order to create timely, concise and unbiased news briefs according to Investopedia’s editorial guidelines. Four to five years ago he interned at Montserrat Development Corporation (MDC) coming out with glowing recommendations Warren Cassell Jr. is a third-year undergraduate accounting student at The George Washington University. Prior to pursuing tertiary education, Mr. Cassell attended the Montserrat Secondary School where he graduated joint valedictorian in 2015. He worked as a financial writer for Investopedia.com from June 2015 to March 2017 and has had his work published in a number of globally recognized publications including Yahoo Finance, Entrepreneur Magazine and The Huffington Post. School of Business, and CARICOM. It also allows for special situations where such a director brings particular expertise to the Bank. Let us stop the hemorrhaging. Let us honestly begin the future, immediate and forever… Make him a board director of the next board of Bank of Montserrat Ltd.
With my very informed knowledge of Bank of Montserrat Ltd. from its beginning to this day I am convinced the Bank can do with such expertise especially as it struggles with some of the current circumstances it faces. I so pray – think future and let use our consciences, let the bank achieve the goals it set out to. Give the future a real chance of success. It has none without vision – there are those who are now living their vision…that’s where the conscience comes in! Going forward – Elected or otherwise I will publish this.